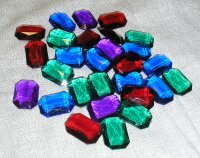 African Jungle Treasure Gems - Great for an African Jungle theme party or treasure hunt! With these beautifully designed plastic jewels, you will REALLY impress your party guests at your African jungle theme party. We have several different color combinations to choose from (see our other packages)  this package reflects all of the colors of the African savannah. 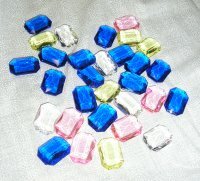 Made from solid, transparent plastic...see how they reflect the light from the flash of the camera! In one bundle you'll receive 30 gems (the exact amount/variety shown in the image above  10 amber, 10 yellow and 10 green). Gems you find at hobby stores have that undesirable, mirrored flat backing, ruining the illusion of a real gem. 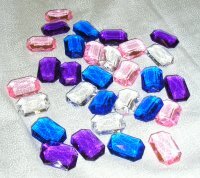 These gems were designed to be picked up and admired from all sides and angles! They each measure 1 in. 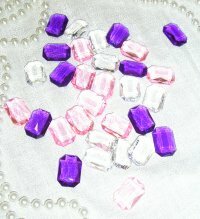 in size (along its widest) and are great for table centerpieces, party goody bags and so much more! 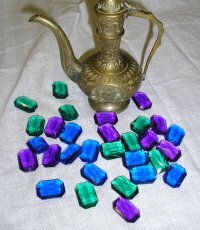 Click HERE to order the African Jungle Collection - Treasure Gems! 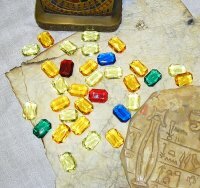 See our other themed treasure gem collections!